Invisible Disabilities Week isn't until October, but May is Ehlers-Danlos Syndrome Awareness Month. 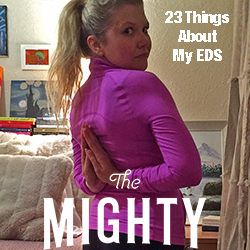 When the media does feature Ehlers-Danlos Syndrome (EDS), the focus is usually on those of us who dislocate multiple times a day, the chronic pain, those who can contort their bodies into extreme positions, and sometimes extremely stretchy skin. EDS, a genetic connective tissue disorder, is very under-recognized, even by the medical community, as most doctors, when they have heard of EDS, are only familiar with the well-emphasized symptoms. The lack of emphasis on the other signs means that those of us who present more subtly struggle immensely in finding answers. Some of us, like me, even know our diagnoses going into our appointments and yet still struggle to find a doctor willing to learn and listen long enough to provide us with the "official" medical confirmation. Don't get me wrong, we all struggle. From the obvious to the subtle, to live with EDS is to suffer, but even a small amount of recognition and a slight increase in awareness of our disease could go a long way towards improving all our lives. Most doctors assess for EDS solely on the basis of hypermobility, but the most prevalent symptom for EDS patients, in addition to chronic pain, is chronic fatigue. Many of us may not even be aware that we're hypermobile – I certainly had no idea. Other prominent symptoms are skin fragility, hemorrhaging tendency, proprioceptive disturbances (difficulty assessing the body's position in the world: rolling ankles, legs collapsing, bumping into objects, people, and door frames, and clumsiness, such as dropping things), constipation, gastro-oesophagal reflux, dyspnea, cognitive difficulties, and dysautonomia. Connective tissue is the most abundant protein in the body, so defective connective tissue can present in any number of ways, with a myriad of wide-ranging symptoms and severity, depending on the patient. EDS does have a very distinct clinical picture, but it's not the picture that's well-known presently. The lack of awareness around EDS and its multi-systemic presentation needs to change. The first time I complained of recurrent chest pain and pain in my arms and legs, I was four. Doctors searched for the source of my chronic hip pain multiple times throughout my childhood, but they never found anything and eventually, they stopped trying. Eleven years ago, I began reporting chronic fatigue. I was provided a variety of seemingly disconnected diagnoses, but it never made sense to me that everything wasn't all connected. Four years ago, frustrated with no doctor even making an attempt to help me, I started reading medical research myself. Having now found a lot of my answers, I'm still frustrated for every individual who has to go through similar experiences, including having to repeatedly face pervasive intolerances and a complete lack of understanding. I've learned a lot during my journey, but the fact that's become most apparent to me is that nothing is going to change if no one talks about their experiences. So, in honor of all the zebras out there, here are 30 things people may not know about my invisible disabilities. 4. The biggest adjustment I’ve had to make is: Knowing I can't do everything. 5. Most people assume: Everything comes easy to me, and because I look fine, I am fine. 6. The hardest part about mornings are: Getting out of bed + SHOWERS. Heat and prolonged standing exacerbate and intensify Dysautonomia symptoms. In EDS, stretchy veins are likely the cause of blood pooling in the lower limbs, making it more difficult for blood to return to the brain, resulting in deoxygenation. In healthy individuals, postural changes are regulated by the autonomic nervous system, and the body automatically adjusts. However, for the majority of EDS patients, this automatic regulation is dysfunctional. Washing my hair even causes symptomatic problems, as holding my hands over my head reduces blood flow return to my heart, causing my heart to beat even faster, making what should be a simple act of showering into an exhausting and fatiguing experience, as my heart works overtime trying to pump blood to my body. We do sometimes have visible symptoms, but most of the time, many of us look completely healthy. Please don't judge. You may never know about the daily struggles faced by those living with invisible illnesses and disabilities. 9. The hardest part about nights are: Knowing I'll be having the *terrible morning, can't get up, fatigue even worse than usual* feeling all over again. 11. Regarding alternative treatments I: Am not opposed, but I want to do my own research. 12. If I had to choose between an invisible illness or visible I would choose: Invisible. Everything I've gone through has made me the person I am today. However, in many ways it may be easier to have a visible illness; there would likely be fewer times where I'm challenged to have to "prove" my disabilities and told that I don't know my own experiences and symptoms. 13. Regarding working and career: I have too many interests for my own good. I want to do everything, yet – see #4. 14. People would be surprised to know: I've had never-ending fatigue every single day since 2005. 15. The hardest thing to accept about my new reality has been: Nothing. I've lived with this reality for a very long time – I simply didn't yet have a "name" for it. 16. Something I never thought I could do with my illness that I did was: I honestly have no answer for this question. I've always felt that anything is possible, and I aim to continue having new experiences and being a huge overachiever for many years to come. 17. The commercials about my illness: Do not exist. 18. Something I really miss doing since I was diagnosed is: Having free time to sit and read non-medical material for fun. 19. It was really hard to have to give up: Free time. Instead, I see multiple doctors, have over 10 patient portals, and spend my time organizing my medical records and shuttling information back and forth between doctors. I also spend time researching, because my symptoms still aren't all accounted for, and no one else is going to do all the rare disease research reading for me. 20. A new hobby I have taken up since my diagnosis is: Interacting with other patients in online forums -- and hopefully helping at least a few people by utilizing all the massive knowledge I've acquired during my four years of medical research while studying myself and finally figuring out my own diagnoses. 22. My illness has taught me: Two things. 1. To always trust myself, no matter what "authorities" or "experts" rudely dictate to me without ever really speaking to me and/or evaluating me, and 2. There's enough pain in this world. Don't make it worse for anyone. 23. Want to know a secret? Three things people say that get under my skin are: 1. "You don't know your own symptoms," and 2. "You don't have that symptom." I'm the only person who has lived my experiences, and only I have my symptoms. I spend far too much time photographing symptoms, because I know I'll have to "prove" they happened. 3. "Ask a doctor." Uncommon diagnoses and uncommon symptoms require uncommon thinking. Patients often can't just ask any doctor their questions. Most doctors are not experienced in treating complex patients, and many refuse to treat us. Frequently, doctors will ignore a symptom, or tell us a symptom isn't possible, rather than admitting not knowing. We have to do our own research, and many of us are VERY good at it. Please don't de-value our knowledge or accuse us of "anxiety," simply because we ask questions on Internet forums. We may not have "a doctor" to ask. 24. But I love it when people: Listen with an open mind. 26. When someone is diagnosed I’d like to tell them: You're not alone, always trust yourself, and don't argue with idiots (this statement goes for encounters with uninformed doctors who refuse to listen, too). It's like George Carlin said, "Never argue with an idiot. They will only bring you down to their level and beat you with experience." If they have a medical degree, they'll likely also provide you with a lot of inaccurate documentation in your records that you'll have a lot of difficulty getting corrected. There are good doctors out there, and there are doctors who are willing to admit they don't know everything, doctors that want to learn, and doctors who will help you and be your support system. If you haven't found one of the good ones yet, keep looking. 27. Something that has surprised me about living with an illness is: The massive lack of understanding that exists for invisible illnesses and disabilities, and the unnecessary pain individuals deal with that is forcibly imposed upon them, often daily, by others. 28. The nicest thing someone did for me when I wasn’t feeling well was: Listen, and try to understand. 29. I’m involved with Ehlers-Danlos Syndrome Awareness Month because: Awareness matters. To quote Jane Goodall, “What you do makes a difference, and you have to decide what kind of difference you want to make.” Individuals with Ehlers-Danlos Syndrome shouldn't have to fight for their diagnoses, they shouldn't have to educate geneticists who claim to be "experts," and they shouldn't have to constantly prove and re-prove the reality they've been dealt. We have a right to competent medical care and support, and we shouldn't have to diagnose ourselves and then beg not only for our "official" diagnosis but also for simply a doctor to help improve our quality of life – in whatever way such improvement can be achieved. 30. The fact that you read this list makes me feel: That you're likely one of the following: Someone looking for material to use against me (shame on you), really bored, know me personally and are being supportive by reading and learning far too much information about me, or you have similar experiences and can relate. Most EDS patients have skin that's mildly hyperextensible or not stretchy at all. The idea that all EDS patients have excessively stretchy skin is a misnomer that has unfortunately been widely spread throughout the medical community. The disease originally described by Danlos was a case of Pseudoxanthoma elasticum, not Ehlers-Danlos Syndrome. Some with EDS exhibit skeletal characteristics of Marfan Syndrome, known as Marfanoid habitus, which can include arachnodactyly (long, slender fingers), dolichostenomelia (long, slender limbs), increased arm span-to-height ratio (>1.05), and decreased lower-to-upper body ratio (<0.85). Together, the Steinberg thumb sign and the Walker-Murdoch wrist sign are diagnostic for arachnodactyly. Hypermobility and flexibility are not one in the same, yet many doctors confuse these terms. Flexibility concerns muscles, whereas hypermobility deals with ligaments. In EDS, we have weak collagen in our ligaments, which are bands made of connective tissue. Many EDS patients actually have extremely tight hamstrings, as our muscles have tightened while trying to protect and stabilize our hypermobile spines. Having danced for 13 years, I never knew my external hip rotation range wasn't normal. Dancers with inherited hypermobility have "an abnormality of their connective tissue that allows for joint laxity;" laxity is also found in EDS, as it is a genetic connective tissue disorder. I've maintained this site as advertisement-free, as I believe ads distract from my intent in providing resources and communicating factual, scientific, and accurate information. I do this research and writing in my own free time and hope that my efforts help others in finding answers to better their own quality of life. If my work has helped you, please consider donating or buying me a coffee.